What a great day! To make things even better, we had pretty good weather for an October day on the big water in Michigan, and cameraguy Mark Gomez tagged along with his cameras to record the action, while sneaking in a little fishing himself. Probably the only thing about the day that didn't go perfect was yours truly not being able to get a hook into the St. Clair muskies we were targeting. We stopped at Bob's favorite bait shop - Anglers Point Marina - across from the Selfridge MDNRE public launch site. I asked Bob for a recommendation on his world famous Brunner Runner bucktail spinners and he pointed me right away to a #10 white Colorado-bladed Hot Pink Baby. So I bought it. Good move! Brunner Runners are the only bucktail you don't need a steel leader for thanks to an extra long heavy wire arm. After borrowing a BIG net - Bob took one look at my 'baby' bass net and said, "that won't do" - we launched my Ranger bass boat and made the run to Brunner Island in Bob's beloved Anchor Bay. Some people know the island at the end of the North Channel by another name, but as of now, I'm officially renaming it to Brunner Island! 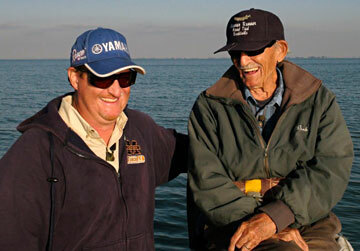 Bob's been fishing St. Clair for over 80 years. I doubt anyone alive can claim more time around that island than Bob! Since Mr. Brunner is a Legendary Guide in the Fresh Water Hall of Fame over there in Hayward Wisconsin (one of only 6 from Michigan), I started with his recommended Brunner Runner Hot Pink Baby bucktail. It didn't take long before I got thumped while slow-rolling over the top of the weeds along the sand drop. I missed the fish! That happens with muskies even more than bass. The way the day went though, I kept getting most of the bites. All on his recommended Hot Pink Baby Brunner Runner! I was thinking more and more that I made a good move buying Bob's first recommendation. The only problem was, I wasn't executing what the fish were giving me! After several bites and no fish, others in the boat (cameraguy) were questioning if I was actually getting bites or possibly just not smart enough to tell the difference between bites and weeds!! Bob though, being the expert that he is (and maybe because I was using the hot bait) seemed more accommodating to the idea that I was getting bit. Just that I maybe didn't know how to hook fish... About that time, I felt what had to be a fish stopping the big lure. Missed again! Bob says throw right back over those weeds! Again, the bait goes dead and this time I feel a solid bump! Swing and a miss! Again! I give the lure a jump and I can see the swimming log coming up behind Hot Pink Baby! BAM!! The big musky nails the bait again! And again, swing and a miss!! Now I'm getting more than a little exasperated... I saw that big fish. It never really opened its mouth. Just rammed the bait from behind!